Fireflies light the balmy evenings while crickets provide the soundtrack, crates of watermelons block the aisle at the fruttivendolo, and nothing tastes better than a cool crisp glass of Verdicchio to accompany spaghetti dressed with vongole - it's summer again in the Marche. One of the region's rarer wines is the red sparkling Vernaccia di Serrapetrona, from the small town of Serrapetrona in Macerata province. Most commonly a sweet dessert wine, it's also available in a drier secco version that goes particularly well with the Marche's soft ciauscolo salame. The feast of Corpus Domini, or Corpus Christi, is frequently marked by an infiorata when the main streets of many towns in Italy are decorated with lavish quantities of flower petals in suitably religious designs. This year it falls on Sunday 22 June, and towns in the Marche worth visiting to see good examples of these floral tapestries include Castelraimondo (MC), Fabriano (AN), Montefiore dell'Aso (AP), Ortezzano (FM), San Paolo di Jesi (AN) and Servigliano (FM). A major exhibition of high medieval art in Italy opens this summer in Fabriano, in Ancona province. Entitled From Giotto to Gentile - Painting and Sculpture at Fabriano from the 13th and 14th Century, the exhibition runs from 25 July until 30 November 2014. The show, curated by the colourful Italian art critic Vittorio Sgarbi, features over 100 works on display in the pinacoteca civica and a handful of the town's outstanding churches. 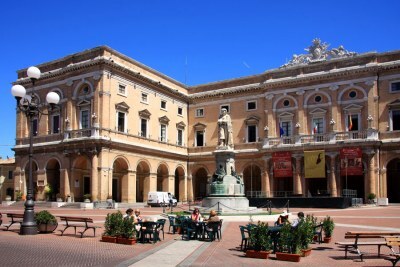 This month's image of one of the region's piazze, or town squares, features the monumental Piazza Leopardi in Recanati, Macerata province, whose name celebrates the town's most famous son, the Romantic poet Giacomo Leopardi. This July sees the first ever Shakespeare Summer School in Urbino - a chance to work on Romeo and Juliet, The Merchant of Venice and Much Ado About Nothing with leading directors and actors who have worked extensively with Britain's Royal Shakespeare Company. There are still a few places left on the course, which runs from 12 to 26 July and includes 4-star hotel accommodation. This summer sees the return of weekly tours to Villa Imperiale, a splendid Renaissance villa and gardens in the hills above Pesaro. There is a guided tour every Wednesday afternoon until 24 September, including bus transfer from central Pesaro. A paler shade of blue? The region can once again boast one of the highest number of Blue Flag beaches of any region in Italy, only just beaten by Liguria. This year, however, only seventeen towns are entitled to fly Blue Flags - one less, we note, than last year. Blue Flags are awarded by the Foundation for Environmental Education across Europe to environmentally well-kept beaches. The prestigious "eco-label" is given to sites that meet strict criteria including water quality, environmental management, safety and other services. Last winter a large section of the road collapsed within the spectacular Furlo Gorge in the northern Marche. Although it will be many years before the Gorge re-opens to cars, there is now a pedestrian path that allows the whole magnificent gorge to be visited by walkers. A great opportunity to see the place without the roar of cars and motorbikes. Ascoli Piceno's medieval tournament, the Giostra della Quintana, on Sunday 3 August may not be as famous as Siena's Palio, but it's almost as thrilling and a lot easier to get tickets for. The celebrated black statue of the Madonna and Child in the Sanctuary of the Holy House at Loreto is a 20th-century copy of the original which was destroyed by fire in 1921.